Recollection on pinhole photography: I wonder what was the oldest memory of myself on pinhole photography? Probably it was the memory when I was a lower grade schoolchild of a primary school or much more younger. It was a morning after snowfall all through the night, when the sun was extremely dazzling. I was maybe sick in a bed because of cold, when I saw a pinhole phenomenon definitely. Light was coming from outside through a knothole of a wooden shelter (“amado” in Japanese) and the light beam in which dusts were dancing shined a paper sliding door (“shoji” in Japanese) of the room, where the scenery of the outside was projected (An old house built in Japanese style was made of wood and paper!). This is a similar scene as that of the woodcut by Hokusai Katsushika, “Sai-ana no Fuji (Mt. Fuji projected through a knothole)”. In this woodcut an image of Mt.Fuji is projected on a shoji through a knothole of an amado as seen in the figure shown later of this page. Recently I learned that such a phenomenon is called as “koana toei” in Japanese literally translated as “a small hole projection”. At the science lesson of the primary school we learned a pinhole photograph which is translated as “hariana shashin”, the literal translation of the “pinhole photography.” There is a device, “camera obscura”, which is closely related to the pinhole photography. I know the term “camera obscura” since long before. The camera obscura is a device to the back-screen of which an image is projected by rectilinearly propagating light through a pinhole or a lens set on the front wall of the device, and was used to trace a projected image in order to paint a picture at one time. The camera obscura is thought as the predecessor of a modern camera. Pinhole projection of Mt. Fuji The famous woodblock artist of the Edo period, Hokusai Katsushika, published a woodblock print named as “Sai-ana no Fuji” in the illustrated book titled as “Fugaku Hyakkei (100 scenes of Mt. Fuji).” The “Saiana no Fuji” itself will be shown later. Altamira, Lascaux,…Cave arts: How far we can date back to trace the origin of the pinhole photography? There is a theory that mankind of the paleolithic age had already known the pinhole phenomenon. I suppose it may be true because, as described above, even a small boy who is a lower grade schoolchild of a primary school observed the phenomenon and keeps it vivid in his memory after more than half a century. It is such an impressive phenomenon! Some researchers are trying to prove this theory. An example of such researches is found in the web-site “Paleo-Camera” by Matt Gatton. 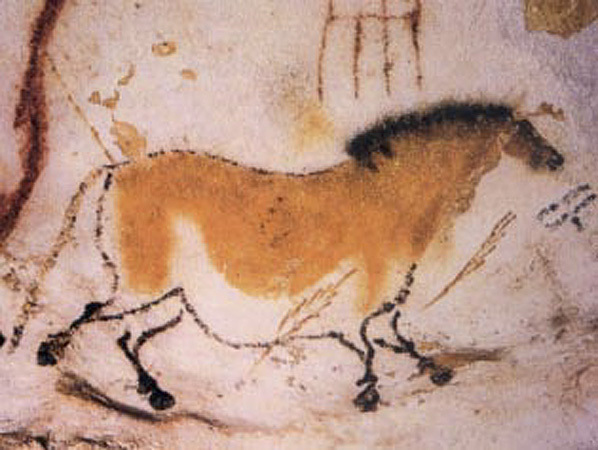 It is the established theory that the origin of the art is the cave art or the portable art on plaquets by mankind of the paleolithic age, but as for motivation behind such arts and situation under which the paleolithic people started the arts, there are various theories and no generally accepted single conclusion has been obtained. These theories are considered to be classified into three categories, i.e., Needs (Interpreted Purpose), Ability (Mental Capacities), and Experience (Recognition). “Needs” mean the purposes to realize a large take in hunting, or to avoid disasters, and “Ability” means the Mental Capacities to accept “the art-for-art” or “the art-for-life”, which appeared with the evolution of the human brain. On the one hand “Experience” means to recognize things around, such as patterns made by bear’s craws or unintended patterns on a worked stone and to expand them to arts. Though these are not competitive but cooperative for the origin of the art, Gatton is going to clarify the situation under which the paleolithic people started the cave art or the portable art by paying attention on “Experience” among them, i.e., the pinhole phenomenon observed in daily lives of the paleolithic people. The cave arts of Altamira in Spain and Lascaux in France are especially famous and more and more cave arts or portable arts have been found in the world. The paleolithic age spans from 2,500,000 years ago to 10,000 years ago, and the period between 35,000 and 10,000 years ago is called as the upper paleolithic age (late stone age). This period is also the later half of the Würm ice age and in this period only the modern humans were left on the Earth. The cave art and the portable art mentioned above were produced in this age. As the climate was very cold, humans began to use a tent made of animal hide or a hide curtain for their dwelling place to get away from the cold climate. Gatton considers that there were inevitably small pinholes in these animal hides and the paleolithic people experienced the pinhole phenomenon in the tent or in the cave with the hide curtain. Gatton carried out several experiments with his students to clarify that the dwelling place was dark enough so that the paleolithic people could see the pinhole phenomenon and that in such a place the picture on a plaquet obtained by tracing the pinhole-projected moving object becomes very similar to the existing paleolithic pictures. Though it is not possible to conclude only from his researches that the origin of the paleolithic art relates directly to the pinhole phenomenon, the idea is very interesting and it might be possible that the pinhole phenomenon were observed in the daily life of the paleolithic people. Mozi and Aristotle： What is the oldest written document on the pinhole phenomenon? Pinhole Phenomenon in nature Aristotle described that during a solar eclipse the pinhole phenomenon is observed by the solar light which comes through the overlapping leaves of a plane tree. In the western countries the oldest record describing the pinhole phenomenon is the one by Aristotle (B.C. 384 -322) written in 4th century B.C., where solar images projected on the ground by the sunlight through the trees during a solar eclipse was described. Though Aristotle described ”plane trees or other broadleaf trees….“, it can be easily imagined that many pinholes produced by overlapping leaves of any broadleaf tree project many images of the solar eclipse on the ground. The above figure shows such a situation. If one would like to look at actual pictures of such a phenomenon one can find a lot of such pictures, for example, in Wikimedia Commons, as shown below. 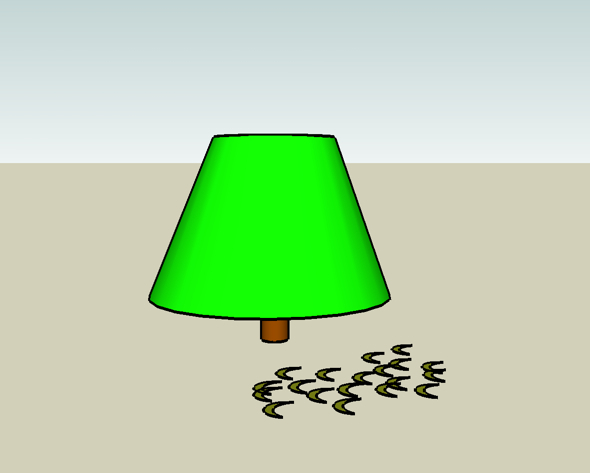 When one sees the projected image one finds that the shape of the image seems as the same as that of the object (the sun) regardless of the shape of the hole through which the light comes. This was posed as one of the Aristotle’s problems (Appendix 1), which had not been solved in the western countries until Francesco Maurolico (1494 – 1575) and Johannes Kepler (1575 – 1630) solved it during Renaissance. On the other hand in the Oriental world a written record on the pinhole phenomenon was existing since 5th century B.C., which is one century earlier than the Aristotle’s document. This is Mozi (墨子), the text book of the Mohist school lead by Mozi (also Mo Ti, Mo Di (墨翟): 450? – 390? B.C. ), and the pinhole phenomenon is described in 4 pages of Mozi, i.e., Mo-Jing 1 & 2, Mo-Jing-Shuo 1 & 2 (Appendix 2). The existing text, Mozi, is composed of 53 pages and the above 4 pages are devoted to descriptions of logics, science and technology. Actually not only the knowledge of the optics but also other fields of the classical physics are described in these 4 pages. These subject matters have been introduced by Joseph Needham (1900 – 1995) and widely known all over the world in the middle of 20th century. By the way, Mo-Jing and Mo-Jing-Shuo are extremely difficult to understand because of the highly simplified description with errors in writing which slipped into them during a long time of accession. Though there are such difficulties it is generally accepted that Mozi was understanding correctly the pinhole phenomenon up to a certain level. It is interesting enough that Aristotle couldn’t understand the reason why the pinhole image was inverted but Mozi seems to have understood the reason correctly by judging from the description in Mo-Jing and Mo-Jing-Shuo. In the western countries this problem remained unsolved until Leonardo da Vinci (Leonardo di ser Piero da Vinci, 1452 – 1519) in Renaissance. Days of Camera Obscura: In what way was the pinhole phenomenon found by Mozi and Aristotle developing into the modern photography? In the western countries there are a huge volume of records on the camera obscuras on the historical pathway from Aristotle’s finding of the pinhole phenomenon to the modern photographic technology. As there are a lot of excellent reviews as well as research papers in addition to these original records, I describe them only briefly in this site. Before Renaissance, i.e., during Hellenistic period and ancient Roman period the pinhole phenomenon seldom came to an issue in the western countries. In this period the most important person concerning the pinhole phenomenon was an Arabian polymath Alhazen (Abū ‘Alī al-Ḥasan ibn al-Ḥasan ibn al-Haytham: 965? -1039?). Alhazen contributed to physics and mathematics immeasurably. He is regarded as the father of modern optics and especially he analyzed and described the pinhole phenomenon correctly. Actually he made the first ”camera obscura“ in the world and carried out some experiments on it. He used it for observing a solar eclipse, too. When he studied the camera obscura he named it as ”Al-Bayt al-Muthlim“ which means ”dark room“ in English. Incidentally the first person who called this device as ”camera obscura“ is considered to be Johannes Kepler (1604). We would like to mention some names of key-persons who played important roles in the history of the camera obscura during Renaissance. They are, Roger Bacon (1214 – 1294) who was an English philosopher and a Franciscan friar, and he introduced the Islamic science to the western countries including the optics especially the camera obscura to be used for observation of a solar eclipse, Fillippo Brunelleschi (1377 – 1446) who was an architect and contributed to establish the perspectivism, the famous ”uomo universale“, Leonardo da Vinci (1452 – 1519) who designed the camera obscura in the course of studying the structure and the function of eyes and described the camera obscura in his book ”Codex Atlanticus“(1490). There were a lot of artists and researchers as users of the camera obscura, such as Albrecht Dürer (1471 – 1528), a German painter, and Johannes Vermeer (1632 – 1675) a Dutch painter, who are very famous artists in the world. As described later Nicolaus Copernicus (1473 – 1543), Tycho Brahe (1546 – 1601), and Jahannes Kepler (1571 – 1630) who played very important roles for the incunabular modern physics, are considered to have used pinhole telescopes for astronomical observation. Especially, Kepler is known as he solved the Aristotle’s problem independently from Francesco Maurolico (1494 – 1575) (Appendix 1). Other than them there were a lot of artists, architects, astronomers, mathematicians, and so on who are widely known as users or researchers of the camera obscure during Renaissance. As for China, there are several documents (Appendix 3) on the pinhole phenomenon published after Mozi. Though the ”camera obscura“ and the pinhole phenomenon were interested in during Tang Dynasty and Song Dynasty, no noticeable progress was found in the theory of the phenomenon. Instead, in a book, ”Youyang Zazu“ (863) written by Duan Cheng Shi (803? – 863) erroneous explanation was given on the reason why an inverted image is attained. It seems that the understanding on the optics went backward from the days of Mozi. However, 2 centuries later from Duan Cheng Shi in the book, ”Meng Xi Bi Tan“(1086), by Shen Kuo (1031 – 1095) the correct explanation of the phenomenon was given and the error by Duan Cheng Shi was mentioned. In Meng Xi Bi Tang the inversion phenomenon was described minutely as: when a bird flies from west to east the projected image moves from east to west, and a projected image of a tower is upside down. Concerning the Chinese history of science and technology it is noteworthy that there remain a lot of records of astronomical observations. These are not directly related to the pinhole phenomenon but it is very important that systematic records of sunspots have been preserved. In contrast with it, in western countries sunspots were discovered after the camera obscura was introduced in Renaissance. In the ancient China sunspots were probably observed when the sun was near the horizon in the morning or the evening and, moreover, when the sunspots were especially large. There is no document which tells that the old Chinese astronomers utilized the pinhole phenomenon for their observations. By the way, though the ”camera obscura“ is often mentioned in relation with the pinhole phenomenon, practically used camera obscuras were usually ones with a lens. An image of a camera obscura with a pinhole was too obscure to use indoors and impractical. Though from the viewpoint of the history of arts it might not be necessary to distinguish the camera obscura with a lens and with a pinhole, this difference is important as we are considering the history of the pinhole camera. Hokusai Katsushika, Bakin Takizawa, and Artists of Edo Period: When was the pinhole phenomenon brought to the knowledge of Japanese people? It is not clear who was the first who payed attention to the pinhole phenomenon in Japan. I don’t know any document before the Edo Period (1603 – 1868) which describes things relating the pinhole phenomenon. When we talk about the science and technology of the Edo Period Gen’nai Hiraga (1728 – 1780) is always mentioned, but it is not clear whether Gen’nai Hiraga got directly engaged in matters relating the pinhole phenomenon or not. According to Eizo no Kigen (“Roots of Vision” by Kuniaki Nakagawa; in Japanese) the first recorded data of the camera obscura in Japan is “Anshitsu-kyo (donker camer glassen)” kept in the journal book of imported articles of Dutch Trading House in Dejima, which was imported from Holland in 1645 and is believed to be the same article with that written in the Dutch Trading House Diary of Hirado in 1646. After the “camera obscura” was imported it became presumably widespread in Japan. Though at the time it was called by various Japanese names as “Anshitsu-Kyo”, “Ansitsu-Shashin-Kyo” and so on, finally “Shashin-Kyo” became to stay as the Japanese name of the camera obscure. For example, there is a description on “Shashin-Kyo” in the book “Rangaku-Kotohajime” by Genpaku Sugita (1733-1817). It is not unquestionable when the name, “Shashin-Kyo” began to be used but Gen’nai Hiraga and Kohkan Shiba (1747 – 1818), a famous painter, are believed to be the namers of the “Shashin-Kyo” and the users of it, too. It is certain from various documents that Kohkan Shiba was using a Shashin-Kyo for painting. On the other hand, it is described in the above “Eizo no Kigen” that Gen’nai Hiraga must have use the “Shashin-Kyo” from the following reason. The reason is that there are a painting of “Seiko Fujin-zu (a lady of a western country)” (Akita Prefectural Museum), which extremely resembles a painting of “Seiko Fujin-zu”, by Gen’nai Hiraga (Kobe Municipal Museum), and a painting of “Seiko Danjo-zu (a gentleman and a lady of a western country)” (Kobe municipal museum), a lady of which also resembles extremely the left-and-right inverted above paintings. It is supposed that Gen’nai produced same paintings by tracing an original painting by using a “Shashin-Kyo”. The namer of “Shashin-Kyo”, the japanese name of “Camera Obscura” is supposed to be Gen’nai Hiraga who always appears in a topic on science and technology of Edo period. As described in the main text, he is supposed to have used a camera obscura for painting. The above sub-figures are: [left] the left-and-right inverted lady in the painting of “Seiyo Danjo-zu” by Gaseo, [center]”Seiyo Fujin-zu” by Gen’nai Hiraga, and [right] “Seiyo Fujin-zu” handed down as by Gen’nai Hiraga. The camera obscura was imported in the mid-17th century as described above and in the 18th century it is considered that the camera obscuras were used widely in Japan. But these camera obscuras were presumed to be those with a lens. Then is there any historical record in Japan on the pinhole phenomenon itself? This picture is in the ilustrated book titled “Fugaku-Hyakkei (100 Scenes of Mt. Fuji)” by Hokusai Katsushika. As a matter of fact there are just records of the Edo Period which describe the pinhole phenomenon itself. The famous woodblock artist Hokusai Katsushika (1760 – 1849) published an illustrated book titled ”Fugaku Hyakkei (100 Scenes of Mt. Fuji, 1834)“ where a woodblock print ”Saiana no Fuji (Mt. Fuji projected through a knothole)“ is included. This picture is famous in considerable measure and is often cited in relation with the pinhole phenomenon. Similar picture of the pinhole phenomenon is also found in the book ”Kage to Hinata no Chinmon Zui (Literally translated as Collection of unique pictures in dark and bright places, 1803)“ by a similarly famous popular novelist Bakin Takizawa (Bakin Kyokutei) (1767 – 1848). The caption of the picture of the pinhole phenomenon in this book is essentially the same as the essay ”Goshiki no Sansui (Landscape of many colors)“, chapter 23 of the record of travel, ”Kiryo Manroku (1801)“ by the same author. There are described three examples of the pinhole phenomenon realized by a knothole of a wooden wall of a house. “Kage to Hinata no Chinmon Zui” by Bakin Takizawa (Bakin Kyokutei) A scenery of a garden projected through a knothole of a lumber room of a wealthy merchant Shobe-e Fukami at Mikawa. One of them was a scenery of a garden projected through a knothole of a lumber room of a house of a wealthy merchant, Shobe-e Fukami, at Mikawa and another was an image of the tower of Toji temple projected through a knothole of a lumber room of a farmer, Matazaemon Niwa, in Kyoto. The third one was observed at a Yakushi Hall (a house in a temple) in Shinano but Bakin described that he only heard of it and had not seen it yet. Bakin depicted the fineness and the brightness of the projected scenery at the Fukami’s home as that projected by ”Biidoro Kagami“. In the Edo Period ”Biidoro Kagami“ meant sometimes a glass mirror or a telescope made of glass lenses but in this case it might be a “room-type camera obscura” inside which people enjoyed to see a scenery projected on a wall of the room sitting on a floor of the room. In these books Bakin cited the Chinese book, ”Chuo Geng Lu (“Talks while Plough is Resting” or “Records after retiring to countryside”, 1341)“ by Tao Zongyi (1316 – 1369) and the previously described ”Youyang Zatu“ by Duan Cheng Shi. It is interesting that Bakin had not generalized the ”knothole“ phenomenon further. In contrast to Aristotle who generalized the phenomenon produced by the overlapping leaves of a plane tree to that by sieves or by joining fingers of both hands, Bakin seems to have thought that specific knotholes might have special power to reveal such a phenomenon. Anyway at some period Bakin and Hokusai were very close. Therefore, it is supposed that the concept of the pinhole phenomenon came down from Duan Cheng Shi to Bakin Takizawa and then to Hokusai Katsushika.